Some residents of Elysian Valley (also known as Frogtown) want a bike path to be closed down after an elderly woman was sent to the hospital after she was truck by a cyclist on the morning of October 8. The 65-year-old-woman, known to her neighbors as Ms. Yun, was injured near a pedestrian entrance to the bike path on Riverdale Avenue by the L.A. River, reports The Eastsider. 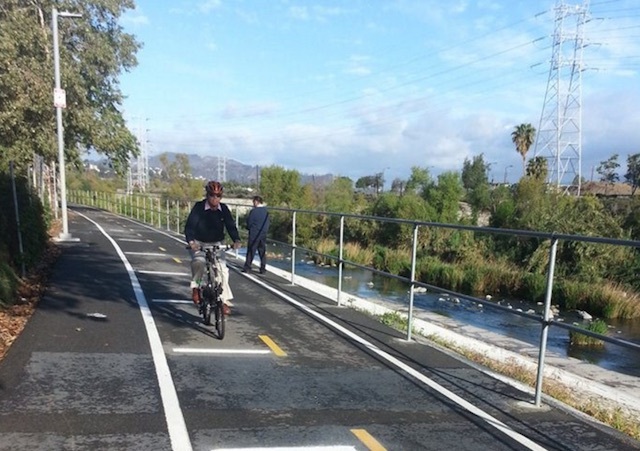 On Wednesday, responding to demands for action, Councilman Mitch O&apos;Farrell released a statement saying that city officials are working to bring changes "[in] the coming months" to the bike path in Elysian Valley. The statement says that "a number of enhancements" will help "notify cyclists of areas with a higher concentration of pedestrians, and where they must slow down or dismount to avoid conflicts." O&apos;Farrell added that there will be a heightened LAPD presence in the area, and told competitive cyclists that the "path is not for you." On the day of the statement, it seemed as if someone decided to take action rather than wait for those changes. As reported by LA Weekly, a red sign reading "Bike Path Closed" appeared by the entrance to the bike path. The sign was not owned by the City, and was largely ignored by cyclists entering the area. The issue has been brewing ever since the bike path was extended through the neighborhood in 2010, according to an earlier Eastsider article. In 2014, another 65-year-old woman was struck by a cyclist from behind and suffered a broken arm. The incident happened about four blocks away from where Yun was hit. The L.A. Department of Transportation has made past attempts to address concerns about safety along the bike path. In 2014 they installed "rumble strips" on parts of the path; the strips are basically thick coats of paint that are meant to work like speed bumps. Some locals said that the action was not enough, however. David de la Torre, a member of the Elysian Valley Neighborhood Watch, told The Eastsider that the strips do "absolutely nothing to reduce speed" among cyclists. The Elysian Valley Neighborhood Watch has been keeping an eye on the bike path ever since its implementation. The group says that the addition of the bike lane has made the path too narrow to be shared by both cyclists and pedestrians. In 2014, the watch group called on O&apos;Farrell to either widen the path, develop a separate bike path on the other side of the river, or re-direct the path to Riverside Drive. Now, after Yun&apos;s injury, the group has taken on a more strident tone. The group posted a photo of Yun in the hospital and demanded that city officials close down the bike path "immediately" until "tangible improvements that guarantee pedestrian safety" are implemented. Seeing as how the group was unimpressed with LADOT&apos;s implementation of rumble strips in 2014, one could presume that the group is treating O&apos;Farrell&apos;s response with some trepidation. LAist has contacted the Elysian Valley Neighborhood Watch for comments. We will provide updates when they come.